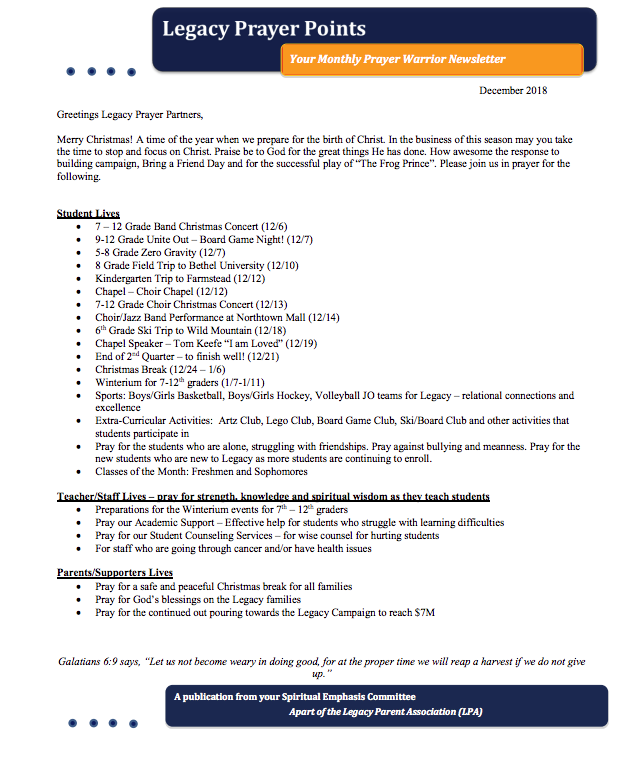 The Prayer Points Newsletter is a guide anybody can use to pray for our school. When you sign up (see prayer wall below) for a specific day of the week to pray, these Prayer Points will be emailed to you monthly. Supporting, encouraging, and pointing the students, Legacy and the community towards Christ through prayer. Each week, we pray for the Legacy faculty, staff and students so that each person is prayed for specifically throughout the year, as well as praying for the events at Legacy each week. Please join us Thursday mornings from 7:45 am- 9:00 am in the School Conference Room. You may email us to learn more, or to send us a prayer request. All prayer requests are confidentially shared with Moms Who Pray on Thursday mornings. Fellowship & prayer over Legacy, our kids, and our staff. Meeting dates and times will be announced in the eNews.